QLogic has a 32Gbit/s Fibre Channel host bus adapter, the QL2700. The company announced a set of faster Ethernet NICs last week, now it's the turn of the Fibre Channel side of its business. Gen 6 or 32Gbit/s Fibre Channel is twice as fast as current 16Gbit/s Gen 5 and the FIbre Channel industry, meaning Brocade, Broadcom’s Emulex unit and QLogic are all announcing Gen 6 products in concert. QLogic’s QL2700 series products are the next step after the QL2600 16Gbit/s HBAs. Increasingly virtualised and multi-core servers want more SAN IO whilst all-flash arrays can pump out more IOs faster than current Fibre Channel can sometimes cope with. This 32gig FC will help prevent the wire becoming a bottleneck. Product comes as single, dual and quad-port cards, with Q advertising up to 248GB/sec aggregate throughput (yes – bytes and bits) and up to 2.6 million IOPS, 650K IOPS/port. Ports can be isolated to provide deterministic performance. This provides independent function, transmit/receive buffers, an on-chip CPU, DMA channels, and a firmware image for each port. N-Port ID virtualisation (NPIV) means one physical port can function as multiple virtual ports, with bandwidth controls and a quality-of-service (QoS) guarantee per virtual machine (VM). The company provides StorFusion diagnostics and management, with built-in forward error correction. This works with supported Brocade switches, hopefully the G620 32 gig one announced today. These QL2700s support link cable LED beacon (LCB) technology, which enables administrators to visually identify both ends of a physical link, without having to physically trace the cable. Industry standard class-specific control (CS-CTL)-based frame prioritisation QoS is supported and this helps to alleviate network congestion. 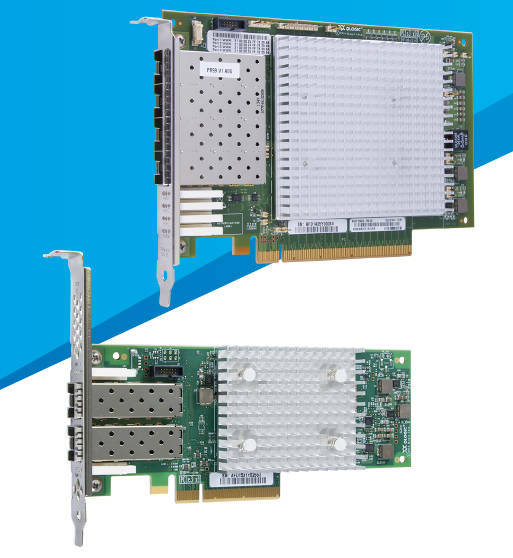 QLogic's 2690 Series Enhanced Gen 5 Fibre Channel Adapters, the 16gig HBAs, have have had new single and dual-port options added. Find a QL2700 product series data sheet here later today.